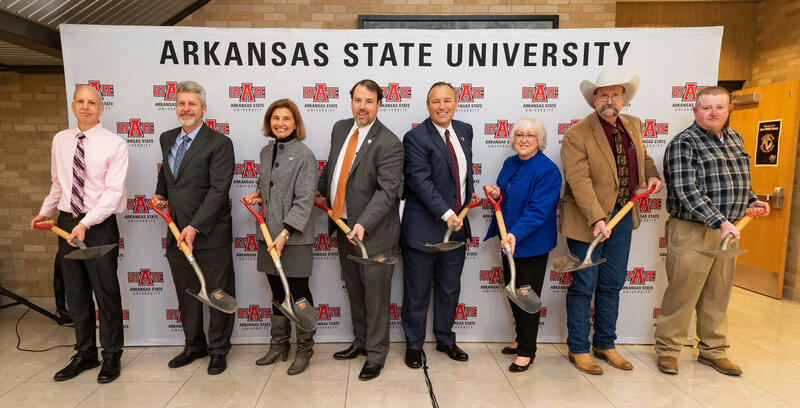 Arkansas State University is celebrating the groundbreaking for its new disaster training pavilion to be located in the small city of Imboden. Ann Kenda has this report for A-State Connections. Due to the possibility of rain or snow, the groundbreaking was moved indoors but participants still posed for pictures with shovels. They’re marking the symbolic beginning of construction on a disaster training area that will educate the next generation of first responders and others about emergency management. "I think it will only add to the great reputation the disaster preparedness/emergency management department already has here at Arkansas State University. Clearly, it’s an unprecedented opportunity for not just our students but for the disaster response community at large so we think it’s going to be a very good thing." That’s professor Deborah Persell, who says the new training area will be very likely to attract more students interested in the field of emergency management to A-State. "We already have students who come to us because of the reputation that the program has built and when you add a facility like this, it’s only going to add to the credibility of the program and honestly it’s not just the credibility, it’s the actual preparation and training that students get that build their credentials and ultimately saves lives." A-State student Casey Williams is excited about what the new training area will mean for the community. "Allowing our program to get out into communities and with these facilities, I hope they are a talking point among different communities and allowing students to be involved with the community and really spread what is disaster preparedness and emergency management is all about. On top of that, just the water rescue training, very straightforward. That kind of training is hard to come by. You have to be in a certain field to do that or in the fire service so being able to do that as a student is really remarkable." The training pavilion will be located in Imboden, a small city in Lawrence County with a population of under 700. Chris Jones is the mayor there. "It’ll benefit us economically for sure if it brings just one person from out of town in because of this center, that’s an impact and if one person comes, then maybe the next time two people will come and it will basically put our community and our area, not just Imboden, but our whole Lawrence – Randolph county area, it will put us on the map." The training area will focus on recovery from tornadoes, earthquakes, flooding, hazardous materials incidents and the like. Chris Caldwell, federal co-chair of the Delta Regional Authority, says it will end up benefitting everyone. "Ultimately it’s being able to provide resources to first responders, sheriff’s office, fire departments, students here at ASU to be able to learn and ultimately provide life-saving skills. What we look at, I think that’s first and foremost, but the economic impact, areas that are going to be able to have resources that they didn’t have before." Another site will be located in the city of Walnut Ridge. The Imboden site is expected to be finished in June, if the weather cooperates with the construction schedule. A-State officials say the projects will enhance its mission to educate not just students but the future leaders of emergency management and disaster preparedness. I’m Ann Kenda for A-State Connections.